Make room in your kitchen cupboards—or better yet, the counter itself—for The Dieline Awards 2018 Best of Show Winner, Mutti. “We wanted this product to represent the high value of the Italian product,” explained Giovanni Stillittano, Designer at Auge Design. He, along with Creative Director & Designer Davide Mosconi, designed something simple, fresh, and without any of the typical Italian food stereotypes in sight. All of the products in the Mutti line have a certain look, Davide and Giovanni wanted to elevate the design to a new aesthetic. They were less concerned about taking a mass-market approach and instead wanted to create something consumers wouldn’t only want to buy, but something they’d want to collect. Creating Mutti’s high-end appeal wasn’t easy, either. Davide mentioned the cans especially posed a problem during the production process, resulting in some trials and errors. Mutti’s simplicity also speaks volumes to its luxury side. “That was a real challenge,” Davide continued. “The ‘less is more’ approach.” While the client initially wanted to put more information on the packaging, Auge Design convinced them to keep things minimal with only the most vital information, including the logo and a describing word. What brings the entire design together—and also proved to be the most time-consuming part of the whole process—was the typography. Davide and Giovanni went through so many options they actually lost count. For the tomato concentrate, for example, you’ll notice a thin, condensed typeface, whereas the can of tomato pulp has larger, chunkier letters. By representing the product through the typography (and individually graphics as well), it allowed them to keep things simple yet alluring. So how does it feel to win the most prestigious award in The Dieline Awards competition for 2018? Auge Design is a young agency which started at the end of 2016. At barely two years into the business, they’re still small but working on expanding with new clients. Without a doubt, an award like this is something to gain even more global recognition. The largest global packaging design competition is now in it’s 9th year. In the U.S. alone, packaging is a 143 billion dollar market. We encounter so much packaging in our day-to-day lives, from the trusted brands we know and love to new items that catch our eyes as we walk through the aisles. In any given day, you touch at least 50 different types of packaging. The Dieline Awards recognizes the absolute best in consumer product packaging design around the globe, and brings awareness to the immense value that lies in well-designed brand packaging. The Dieline Awards welcomed 1400 entries from 21 countries all around the world, and are recognizing only 68 winners. With a jury comprised of 20 global members who went through 2 vigorous rounds of judging lending their time and expertise, each entry was judged with five key elements in mind: Creativity, Marketability, Innovation, Execution, and On-Pack Branding. These winners are truly outstanding in many different ways. We invite you to review this year’s winners. The coveted Dieline Awards Best of Show prize recognizes the highest rated project among all 1400 entries in the entire competition. The Best of the Show award this year goes to Mutti Special Edition for Eataly World which is a project designed by Auge Design. The Dieline Awards Editor’s Choice goes to a design handpicked by The Dieline’s Founder, Andrew Gibbs, for its outstanding mission and execution. This year’s Editor’s Choice award goes to Chobani for their wonderful redesign that launched late last year. The Dieline Awards recognizes one studio for its collective work and contribution to consumer package design over the past year. The award goes to a studio, agency, or in-house team that receives the most overall wins across all categories in The Dieline Awards 2018 competition. This year’s winner is mousegraphics who received one 3rd place and two 1st place awards. Now in our 4th year we’ve partnered with Neenah Packaging to recognize the best use of paper award in a packaging project. With the broadest assortment of captivating colors and unique textures Neenah Packaging helps brands bring design ideas to life. This winner is hand-picked by the Creative Director of Neenah Packaging. As a leader in digital printing, this year we partnered with HP to introduce a special award based on the innovative use of digital printing on packaging. Digital printing offers designers, brands, and consumers endless possibilities to make packaging a one-of-a-kind experience. With our partnership with Nielsen Design Solutions, The Dieline Awards is the only package design awards competition to leverage retail performance data as part of the winner identification process. As a complement to retail data, Nielsen surveys thousands of consumers to assess how well each redesign will address its core communication objective and to gauge purchase preference for the new packages over the old ones. Food of Imagination is a cafe with healthy and delicious products for takeaway. Each dish is an alternation of a useful layer with taste. The endless variety of such alternations, together with fruits and vegetables, unexpectedly appears in familiar recipes and has made the visual language. The cube is the brand-new buy-on-board concept from SAS Scandinavian Airlines. Designed & conceptualized by Designit, developed & produced by deSter, the cube is the result of a unique partnership that offers a simple yet premium and truly Nordic meal experience. Carsodo is a brand of cured meat founded in 1895 in Bescanó, a small town of Girona. The purpose of this redesign was to highlight the company’s expertise and create an identity for the brand. Faithful to our approach of an “honest” design we moved away from the existing packaging approach and started by designing a new logo that references the name of the brand with deliberate economy of means and simple outline. Pchak is a brand of natural snacks – nut supplies and dried fruits. They are presented in a tree hollow with a transparent window through which the customers can see what exactly they buy. Making authentic, great tasting risotto is at the heart of Riso D’Uomo’s mission to make Italian eating easy and appealing. ODE (from Ancient Greek: ᾠδή ōdḗ) is a type of lyrical stanza and a brand new range of Greek premium food products. In Greece, odes were originally poetic pieces performed with musical accompaniment. There is no question that more of the food we consume will have to come from the oceans in the future. Ideally situated in the Lofoten archipelago in Northern Norway, Lofoten Seaweed aims to be part of our future food chain. Chocolate has the universal power to fulfill our need to escape. We wanted to tie the unique characteristics of our product to the motivation of our market, and in studying our client data, we found that the core of our target audience consists of young students and families – both segments looking for experiences that will take them somewhere else. Marou is a chocolate brand whose products live comfortably on the shelves of the world’s finest gourmet shops. The daily life of the brand is quite far removed from that world. As one of the world’s only chocolate makers working at the source of cacao in Vietnam, Marou’s founders are most often found in adventurous conditions in the countryside. When we were approached by Snåsa Water in the of fall of 2014 there was only a wooden shed covering a pipe in the middle of a thick Norwegian forest. The brief was to create a new bottle design addressing a new idea of luxury. Tirelessly produced through time-honored processes in Japan by tea masters, matcha ends up being nothing more than a pure un-compromised green powder; a substance not unlike water, gold, mercury, or a precious stone. The Material Matcha Uji 宇治 identity asks the viewer to contemplate that purity. The vitamin-enriched water of the Nongfu company demanded a carefully balanced design approach that would convey the product’s medicinal qualities without creating an unfriendly or niche-like overall look. The role of a lone bee within the hive is to journey out into the unknown in search of nectar for the colony. The design visually depicts the bee’s journey, the dangers faced and its encounters along the way. Borrowing from the beautiful simplicity of Danish design we created ‘The København Collection’. Each pack embodies an abstract interpretation of Carlsberg’s most iconic ingredients beginning with barley, descended from the earliest varieties cultivated over 10,000 years ago. How do you create the first Corsican craft beer, to appeal to people rooted in and local tradition and culture, but most importantly to the up-and-coming millennial scene, in constant search for exciting nightlife experiences? To pay tribute this year again to the exceptional Veuve Clicquot Ponsardin story, since its foundation in 1772, especially marked by great expeditions throughout the world and its spirit of adventure, and in order to enhance the brand visibility, the agency has imagined a new specific and audacious yet elegant packaging offer, part of the new program ‘Clicquot Journey’, inspired by the traditional road signs: The Clicquot Arrow can point the way. Hugh Hamilton wanted to release a limited collection of two varieties born and bred in Georgia, and two varieties born and bred in Australia. Titled The Exotica Collection—they required packaging that would intrigue and celebrate this exotic, unobtainable series of astounding wines. Vintage dates are always denoted on the bottles, but how many of us really understand the meaning of the year the grapes were harvested? It actually witnesses the natural conditions in which the wine matured; it is its own BIOGRAPHY. Hellstrøm Sommer is an un-aged Aquavit distilled from endemic Norwegian herbs and seaweed. The product is part of Michelin Star Chef Eyvind Hellstrøm’s range of Norwegian spirits and the goal was to transmit a contemporary look and to reflect the non-traditional ingredients while also embracing the magic feel of the ephemeral Norwegian summer. Lone Wolf is the new spirits arm of maverick brewers BrewDog, seeking to challenge the conventions of the so-called craft spirits category with genuine hands-on production. As twin brothers born and raised in Sonoma County, Chris and Brandon Matthies have dedicated their lives serving their community as a firefighter and police officer. In 2012 the two launched Sonoma Brothers Distillery, an artisan distillery, focused on crafting handmade spirits in small batches. We branded the line based on two basic design elements which cooperate towards one, distinct and strong brand identity: a bright and unusual yellow color, a bold typeface and its dynamic visual use on the packaging. Established designed a range of cosmetics for global superstar Rihanna called Fenty Beauty. We were asked to design the entire brand from the ground up including the packaging range, identity, and graphic design language. Following the unprecedented success of our design of the core Fenty Beauty line, Established was asked to design a limited edition capsule collection for the Holiday season of 2017. Indulgent iridescent finishes on the primary packaging refer to Rihanna’s Caribbean heritage and deliver on the festive party spirit. The graphic language of the core line was extended into glitter foils showing the flexibility of the design language in this showstopper design. Wise is a line of high-quality, naturally sourced and eco-responsible personal care products for men that intends to revolutionize the personal care industry by proposing changes at several levels: improving product quality by making them more natural and healthy, reducing packaging pollution by limiting the amount of plastic used, and creating products that are more in line with men’s current lifestyles and convictions. In 2017 method developed a naturally derived line of body washes specifically geared toward the method man. Considering the growing global male grooming market, we focused on providing a solution for men feeling the pressure of a fast-paced lifestyle, and identified an opportunity to help men simplify their mornings and reconnect with nature in their everyday routines. The Agnotis Βaby series of products consists of the following five products: Bath Shampoo, Nappy Cream, St. John’s Wort Oil, Body Milk and Natural Sponge. Edison dreamed of creating a light bulb from cold light. He had been looking at the fireflies and believed that this could also be made by a human. Today nobody is surprised by LED lamps, so we decided to pay tribute to the insight of the great inventor. Alkemista is an all-in-one alcohol infusion vessel designed to help mixologists create and serve fresh, custom crafted spirits at home or in a bar. The product marries the timeless silhouette of the classic spirits bottle with the beautiful simplicity of fine Japanese tea infusion methods. Brief: Create a set of scented candles for Homo Sapiens, a Chinese brand of luxury household goods that believes in bringing traditional handmade skills back to the modern day. Plankejens (Norwegian version of PlankJohn) is a Scandinavian toy manufacturer who creates wooden toys inspired by the toys back in time when our grandparents were kids. Second Place: Masterpieces Never Sleep! When night begins and the museum halls turn empty, the art masterpieces stay awake and look from the darkness. Until the morning they don’t close their eyes, monitoring what happens around. ‘OTSUCHI SASHIKO’ is a Japanese traditional folk art embroidered brand that was established as a reconstruction project in the Otsuchi Town after the Great East Japan Earthquake that occurred on March 11, 2011. For the 2017 launch of Made by Google hardware products, we introduced a brand new identity and packaging system. This design system links a family of products together, both hero products and accompanying accessory products. “Kindness inspires Kindness inspires Kindness…” is the theme for this year’s gift from Ultra Creative to clients and friends. The gift is comprised of five “nesting boxes” (hence the name KINDNEST). The first box and tray with nine custom truffles is intended for the recipient to keep and enjoy. Looking to create a meaningful gift symbolizing our data visualization expertise and strong partnership with clients, we designed a Venn diagram-shaped ceramic shaker set to celebrate the centuries-long pairing of salt and pepper, complete with a decoder and hidden message: happiness is life’s greatest healer. Delicata is a household chocolate brand established in 1926 by the largest Dutch supermarket concern Albert Heijn. Ever since the company invested in developing quality chocolate for an affordable price, making it accessible for a large audience. The brand however never transcended its functional purpose, and as such has little brand recognition, value and preference with consumers. Second Place: Taste & Co.
EBD partnered with Bed Bath and Beyond to design a logo and packaging for their new Taste & Co. brand. Our goal was to create a brand that would resonate with consumers and communicate the quality of the crafted products that were something they might have seen in their grandmother’s pantry. We created a customized font and tagline, then used custom illustrations and a rich color palette to achieve our goal. Competition in the e-commerce retail space is heating up. As a relatively new e-commerce platform Jet.com, part of Walmart, had a reputation to build. And a mission to fulfill – to make shopping more transparent, more efficient and at the same time, a little more fun. The project was to design a system of products (a bottle and its packaging) that can safely hold our evoo par excellence. The main market is Switzerland where the company is also based. For decades, Uwe Ehinger has been digging through remote garages around the world for lost motorcycle relics. This has earned him his custom motorbike shop Ehinger Kraftrad and the nickname ‘The Archaeologist’. In 2017 the 2nd Annual National Playing Card Collection Day (NPCCD) was celebrated. Created by Seasons Playing Cards, this holiday was made as part of their mission to help people rethink the way they look at cards – shifting from the typical mindset of games into an accepted medium of art for collectors worldwide. For the global launch of the Nike Air Vapormax, Nike’s new full-foot air technology, we developed a special package to match the unexpected ingenuity of the product. Our concept was to create an out of the ordinary box that bent the rules of form and finish. Challenge: 2017 marked the 50th anniversary of Maurice Drake’s famous slogan ‘Beanz Meanz Heinz’, recently voted the best of all time in a Creative Review survey. To mark the occasion, Heinz wanted to do something a little bit special: a limited edition celebratory can design and an exclusive partnership with Selfridges. Wise is a brand of body care products that take the core values and beliefs of the Patagonia consumer in mind by offering responsibly sourced body care products. Wise believes that small changes can lead to big differences, so that’s why the products and the packages are derived from nature so they can return to nature. Leafcare is an innovation plant protection product concept aimed to protect or save plants from plant pests and plant diseases. This project seeks to create such a product, which is able to provide a solution to the garden’s problems. The French Gardens represent the concept that Manter’s materials and Arconvert’s knowhow inspired us. An aesthetic reference that has endured over many centuries and which consolidates multiple invitations to discover, feel, contemplate, remember. “Trichologist” is a professional hair and scalp care concept product that will grant users to achieve the most satisfying shampoo experience every use through packaging that is consisted of a replaceable tube, portioning release, scalp massager and a base for easy location. Viupax™ is an innovative patented footwear packaging that is designed to be eco-friendly by using upto 50% less cardboard than traditional shoe boxes and occupies upto 57% less volume during transportation (comparison with various top brands). El tresor (the treasure) is the best-kept secret of Rós Caubó, and the result of selecting the finest olives from the best olive trees to produce a superlative organic oil. This product is designed to be offered as an amenity for exclusive luxury hotels and resorts. The brief that was given to us by the client was to find an environment friendly replacement which would address the present issue of the plastic disposable meal tray as well as add to the consumer experience. The client is an urban, health-food delivery company which primarily targets the fitness-aware population residing in the technology capital of India, Bengaluru. The coveted Dieline Awards Best of Show prize recognizes the highest rated project among all 1400 entries in the entire competition. The Best of the Show award this year goes to Mutti Special Edition for Eataly World which is a project designed by Auge Design. 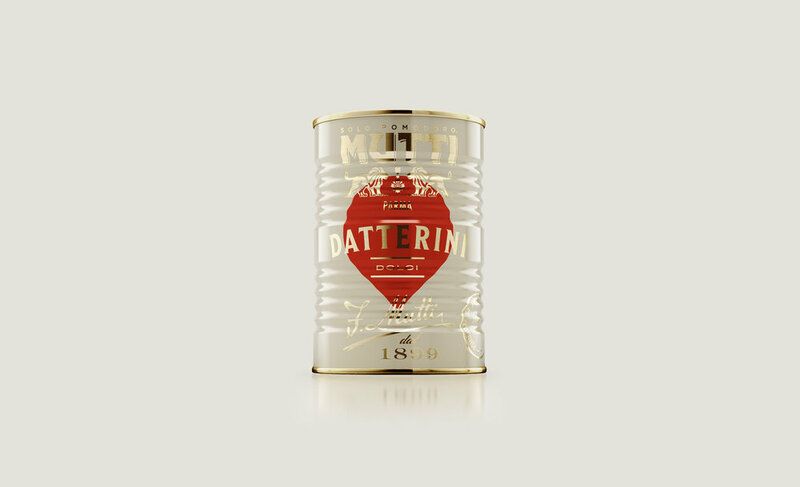 To celebrate this acknowledgment, Mutti commissioned Auge Design the task to re-design six special edition packagings among their standard offer: four lithographed tin cans (Tomato Pulp, Cherry Tomatoes, Peeled Tomatoes, Datterini Tomatoes), a Tomato Puree glass bottle and a Tomato Concentrate tube with its cardboard cluster. Starting from the original format we gave them a new glamorous and luxurious look through the use of sophisticated finishing as gold foils, bright colors contrasting with ivory surfaces, silkscreen printed materials. Tradition, preciousness, quality, design: a tasty souvenir of Italy. Imitated— Imitation of this category leader diluted consumer belief that its price premium was justified. Invisible— With over 100+ competing SKUs on shelf, Chobani was at a disadvantage. Its all-capital, thin-lettered wordmark was difficult to recognize at a short distance. Inaccurate— Chobani products promise naturalness and simplicity. The brand promises craftsmanship and innocence. Yet, the packaging was sterile, shiny, and industrial looking. We approached the work as if we were makers of small-batch yogurt who used simple tools and lacked expertise in packaging design. The watercolor fruit imagery is intentionally imperfect. The color palette is pulled from flora references in Upstate, NY, where the yogurt is made. The typography is a transitional text and simple in it layout. The stamps are placed inconsistently to suggest that they were stamped by hand. Chobani intended to enter the non-Greek category with a new product called “Smooth Yogurt.” The non-Greek buyer lives in the middle of the country, skews older (45+), is highly price-sensitive, chooses yogurt based on flavor, and believes it is their responsibility to uphold “traditional values” in America. Smooth Yogurt’s packaging design needed to accessible, flavor forward, and traditional, while upholding core Chobani brand values of natural and crafted. Our solution is inspired by images of classic Americana-specifically the kitchens and food packaging of the 1960s. Its illustrations are an homage to the floral aprons and wallpapers of this audiences’ childhood homes, but with a modern color palette. The illustration appeals to their need for flavor and reinforces the brand ideas of craftsmanship and natural. Chobani® Flip® is a Greek Yogurt product offering crunchy toppings. The creativity of its ingredient pairings and fun product personality have always been its point of differentiation. Chobani recognized a massive growth opportunity in repositioning Flip® from a breakfast food to an all-day snack competing with candy bars and granola bars. This required a change to the packaging label. Our solution aims to visually communicate-but in our own unique way-as the snack bar category does: graphically and colorfully. Our illustration style is customized to each SKU and emphasizes the key topping that defines each one. The style’s looseness and vibrancy retain the product’s playful personality. Chobani needed packaging for a new product aimed at functional eaters who want subtle flavoring and less sugar in their yogurt. Because rationality defines this consumer’s relationship with food, we designed to those values. We also made sure the packaging aligned with the brand value of craftsmanship. We worked from the idea of small-batch packaging and made information the hero. Classic clay yogurt pots inspired the cup shape. Nutrition information is pulled to the font of the label to improve shelf navigation. Each flavor is identified with a soft color to suggest “subtle flavor.” The color is applied using a dither technique to signal the “infusion” of fruit rather than inclusion of chunks. Copy on the top label romances the varietal fruit used to flavor each SKU. This year’s winner is the 2017 National Playing Card Collection Day Deck designed by Shung Shung. To build awareness around the newly created holiday, Shung Shung designed a product for the client Seasons Playing Cards that would direct traffic intrigue from the public into the small niche. The challenge was to establish a new market category by packaging a new mindset rather than just a physical product itself. We had to go beyond surface level graphic reboots and completely re-engineer the way people experienced playing cards, starting with a new innovative package design. The initial starting points of the design were the emphasis of ‘2’ for the second annual celebration and the quatrefoil – a symbol that represented hand craftsmanship in the pre-industrial revolution and eventually evolved into a symbol for luxury. The new dieline for this project is what Shung Shung calls the “Pluck Tuck”. The packaging was built from the ground up. In celebration of the second annual, the box splits into two pieces contradicting the industry standard one-piece tuck box. Rather than using a typical head-and-shoulders dieline, the cards inside already create a natural guide eliminating the need of the inner sleeve. This allowed Shung Shung to invert the concept and instead develop an exterior friction sleeve which provided a valuable opportunity in real estate for titling and limited edition numbering of each box. The sleeve is cleverly shaped to maintain friction along the edges to keep the box together while being held upright, while still allowing the user to easily pluck open the box to reveal the cards inside. This innovative package design causes the user to rethink about the way they interact with the cards causing a more memorable and differentiating experience. We wanted to use the beautiful handcrafted printing process of engraving on the packaging but needed to keep production within budget. The solution was to figure out a way to produce the inner box to a single plate design that could be used for both top and bottom halves. If the left flap was glued over, legal would show to create the bottom half. If the right flap was glued, the edition name would show making it a top half. Face panel flaps folded inwards increased rigidity of the structure while also enabling us to achieve bonus interior printing. All of this was done in a single press run which allowed the project to take advantage of economies of scale while still maintaining it as a limited edition item. We printed the raised metallic gold engraving onto NEENAH® pearlescent paper. By pairing the metallic engravings to the pearlescent stock we were able to marry the matching shimmering aesthetic together into the overall visual design system that we could not achieve with the single planar reflection that foil gives. The inner box is officially sealed with a Roman numerical made to look like stitch marks that connect the deck together before the seal is broken. The culmination of innovative box engineering, beautiful limited edition designs, and luxury quality print execution created a set of packaging that succeeded in helping start a conversation and changing the way the regular market looked at playing cards from standard commodity to artful collectible. The entire run sold out in less than 24 hours. 100% of the profits were donated to support the associated card collection database Portfolio52.com. As a leader in digital printing, this year we partnered with HP to introduce a special award based on the innovative use of digital printing on packaging. Digital printing offers designers, brands, and consumers endless possibilities to make packaging a one-of-a-kind experience. Entrants answered either yes or no if they used this digital printing technology on their packaging project submission and all entries were reviewed by the HP team. This year, the Best Innovative Use of Digital Printing on Packaging Award goes to Naughty Bags, a project designed by Cramer-Krasselt. Teen pregnancy prevention campaigns have helped reduce the teen birth rate to a record low nationally. But across the country, there are pockets of teens living a very different story. In urban Milwaukee, where the demographic is mainly low-income, single-parent African American households, the teen birth rate is more than three times the national average (on par with third world countries) and STIs are the highest in the country. These teens are receiving the message. They’re just ignoring it because social acceptance is everything. To them, the “right” choice is the lame choice. Condoms just aren’t cool. Which got us to wondering, maybe the best pregnancy prevention campaign for these teens wasn’t a campaign at all. So instead, we changed the product, redesigning every aspect of it. What followed was a new kind of condom brand we created, designed and named Naughty Bags. The sole purpose was to create a brand that urban teens could relate to. One that was approachable, fun, and free and ultimately would start to change the way these teens feel about using condoms. Specifically regarding the design solution, everything from the form factor of the packaging to the design approach on the condom wrappers themselves needed to signal to these teens that Naughty Bags was something different. As we developed the work and ideas, we used groups of teens from these neighborhoods as sounding boards to make sure our work would be relatable to them, this included approaches to art work, the physical packaging, even the euphemisms on the condom wrappers themselves. In the first three months since the launch of Naughty Bags, there’s been an overwhelming response with over 30,000 condoms being distributed to a target audience of 19,000 urban Milwaukee teens, and we’re only just getting started. Package design often doesn’t get the attention it deserves compared to other marketing tactics because it can be difficult to attribute sales impact to pack design. Given Nielsen’s vast data assets, they knew they were in a unique position to demonstrate the power of effective package design and celebrate the brands who are really embracing its potential. Nielsen doesn’t have a panel of experts who select the most beautiful packaging. Their judges are consumers—and the steely, naked truth of in-market performance. Today, they are celebrating five of the most impactful redesigns in fast-moving consumer goods over the past 2 years. Nielsen, the global performance management company, believes in the importance of knowing what consumers watch, buy and listen to. By studying the habits of consumers in over 100 countries, they offer a complete view of trends and habits around the world. Their work is twofold: exploring how people consume content and uncovering what attracts them to make a purchase. Together, this information offers businesses and brands of all sizes a deep understanding of how to improve their performance. Last year, we introduced the Nielsen Design Impact Award, in which winners were chosen by combining choice and diagnostic responses from a large number of category consumers with point-of-sale data, this award highlights the power of an effective redesign. Unlike the other categories where winners are selected by our esteemed jury, the Nielsen Design Impact Award puts the decision in consumers’ hands. By highlighting the statistical improvement a brand can make, the Nielsen Design Impact Award recognizes the tangible power of design. This year we are thrilled to expand this category to recognize more outstanding redesigns that have boosted sales and made a mark in the market. Sabra Guacamole experienced a sales decline for the first time ever in 2015, so they involved Beardwood&Co. to revitalize the offering. Originally, the brand felt it needed to look different from the hummus offerings, but it became apparent the packaging lacked a connection to the parent brand. Bringing the iconic red rim on the hummus package over to the guacamole immediately increased brand impact leading to double digit sales growth. Tessemae’s Organic Salad Dressing realized its once unique folksy charm wasn’t winning with consumers in the refrigerated salad dressing aisle anymore. With the help of Harvey, vibrant pops of color on white backgrounds and a playful, easy-to-navigate system for the health benefits delivered a clean and impactful design resulting in almost 200% growth in sales. If you’re going to shake up the dairy door with a proposition that takes dairy to the next level, your packaging plays a critical role in educating and inspiring consumers to try something different. fairlife did just that only a year after its national launch in 2015. The front panel showcases functional claims, but there’s humanity to the design–the detail in the cow, the soft fonts and the colors are all parts of the craft. Too much art without science is just a nice piece of design work, but too much science without art, feels sterile. In this case, it was that perfect balance. They left no stone unturned to find the design that would lead to 55% sales lift, growing faster than the entire organic, plant-based and dairy alternative segments combined. Hershey was in the midst of a global redesign for its Ice Breakers gum and mints candy brand in 2012. The team realized a new worldwide presence warranted a unifying brand identity in the jungle of the impulse candy section, so they involved LPK. It started with one pack, then transcended into a progressive takeover of the individual sub-lines and the whole brand world. Ice Cubes was the missing piece of the puzzle for Ice Breakers’ new visual identity so the team progressively redesigned each sub-line, and Ice Cubes gum was the missing piece of this new visual identity, resulting in 18% sales growth. Robert Mondavi Private Selection was being overlooked on-shelf and was blending in with the other traditional, cream-colored labels in the competitive set. They involved Affinity Creative Group, who believes in exploring broadly, so they presented the brand with 22 new creative directions. Research then became a pivotal point in the process to narrow down creative options. Robert Mondavi decided on an extreme contrast for their new design with an entirely black label, a very bold move for such a large franchise leading to 14% sales lift. India uses over 800,000 disposable plastic meal trays per day. 99% of these trays end up in landfills. These trays are made up of a mixture of polymers, the main component being Polypropylene (PP), which makes it non-recyclable. We were not only looking at an ecologically conscious packaging design but also a befitting functional product that would enable the storage, transport and support of Indian cuisine. The material and the process: The main consideration was to make sure that the product was biodegradable as well as cost-effective so as to enable easy manufacturing and efficient large-scale production. A composition of 71% cornstarch and 29% PP was used for the same . The mixture made the product completely eco-friendly. The trays were manufactured using the process of thermoforming. The Form and Communication: The product needed to possess a certain degree of familiarity while still holding its own ground. There were grooves placed along the edge as well as between compartments so that the various elements of an Indian meal (often gravy-based) would not mix or spill. The natural colour of cornstarch was kept intact. The form was made softer and more rounded, keeping in mind the brand language. A single line of text, informing the consumer of their decision to use a eco-friendly product, was added. This text and well as the logo were debossed. The lip extensions followed the brand language and enabled the user to remove the lid with ease. Through this packaging design, we aim to bring together innovation, an understanding of the Indian psyche as well as a large-scale solution to the persisting issue of plastic waste management. Company: Smartpaddle Technology Pvt. Ltd. Manufacturer: Windsor Industries Pvt. Ltd. The chief aim was that the user could enjoy this experience with more than one sense and for this reason profound textures have been subtly incorporated within the design. The inspiration for the solutions have been mainly the form of the olive tree trunk in different ways and applications. The ethos of CARPOS® and the project’s guidelines were the tools that 250 exclusively handcrafted bottles saw the light of day. 750 olive trees in the mountains of Rhodope, Greece have been meticulously preserved throughout the year so that the user can enjoy this evoo par excellence with care, like the way it was produced. Each of the 250 limited bottles is ready to be shipped individually in its own eco-sustainable packaging, structured with no adhesives. The minimalistic organic form of the bottle, the materials and its time-consuming process is what makes it look different. However, the attention to detail and love for what they do is what adds value to the brand. Finally, research shows that olive oil, the foundation of the Mediterranean diet, could slow down the ageing process of the brain by up to five years. For this reason, we have created the hashtag campaign #addfiveyearstoyourlife. This awareness campaign is only the first of the many, CARPOS is bound to run! The challenge for this project was to give personality and exclusivity to a little bottle of 50ml of oil. This was achieved by creating a special piece that narrated a story that remains in the memory of the customers. With these premises, we have created an ephemeral package, which must be destroyed to enjoy its content, which requires the consumer’s effort to finally get the final reward, the best organic oil from Rós Caubó. The packaging shape comes from a real “llicorella”, a type of slate stone native to the Mediterranean lands where the olive trees grow. It was produced with recycled paper pulp, an ecological material that transmits roughness but at the same time, it can be shattered easily to open it, mimicking the action of digging the soil. On the inside, a silk paper wraps the glass bottle, with bright and golden tones that gives contrasts with the previous phases of the unboxing. On the bottle, there is an explanatory mini book attached with a rubber band, which emphasizes the idea of treasure using a topographic map of the area, that marks the estate olive tree lands in a decorative way. We also reinforce the idea of quality product with the contrast between a porous paper and the use of golden foil stamping. Viupax™ is international patent protected and designed to be cost efficient in matters of production and transportation and above all, designed in such a way to improve personnel productivity and user experience. It can be transformed into toys extending the life cycle while giving a second use to the pack. It can be transformed into a hand carry bag eliminating the use of paper bags that have a significant cost and carbon footprint. The clothing industry is one of the top polluters in the world. Footwear production is over 20bln pairs/year (was 23bln in 2015). The design of the boxes makes the shoes stand out because the shoe design is visible to customers, and it allows customers to compare, to self-serve without waiting for the sales person as they are able to see model and size availability and can easily select the pair of their choice. On the other hand, sales personnel, can easily identify availability without memorizing model names, carry up to 8 boxes and walk freely around their stores (with the traditional shoe boxes, sales personnel can carry up to 5 boxes). On top of that they can identify similar pairs to provide to customers. This is a known method to increase sales and Viupax makes it easy without the need to memorize model names. Viupax is designed to be flexible in stacking, allowing the boxes to be stored in many new and interesting ways or to be converted into a stand. The use of paper shopping bags can be eliminated, as Viupax can be converted into a carry bag or shoulder bag to be easily transported by the customer, cutting costs and improving brand sustainability.